Of all of the air pollutants that are measured in Central Texas, ground-level ozone is the one that the region has the most trouble with. While the region's air pollution levels meet federal requirements, we sometimes have days when ground-level ozone reaches levels that are considered unhealthy for sensitive groups, such as children, older individuals, and adults with respiratory problems such as asthma. Ozone is a colorless gas made up of three oxygen atoms. Ozone is not emitted directly into the air but is formed through chemical reactions between natural and man-made emissions of nitrogen oxides (NOx) and volatile organic compounds (VOCs) in the presence of sunlight. These gaseous compounds mix like a thin soup in the ambient, or outdoor, air, and when they interact with sunlight, ozone is formed. 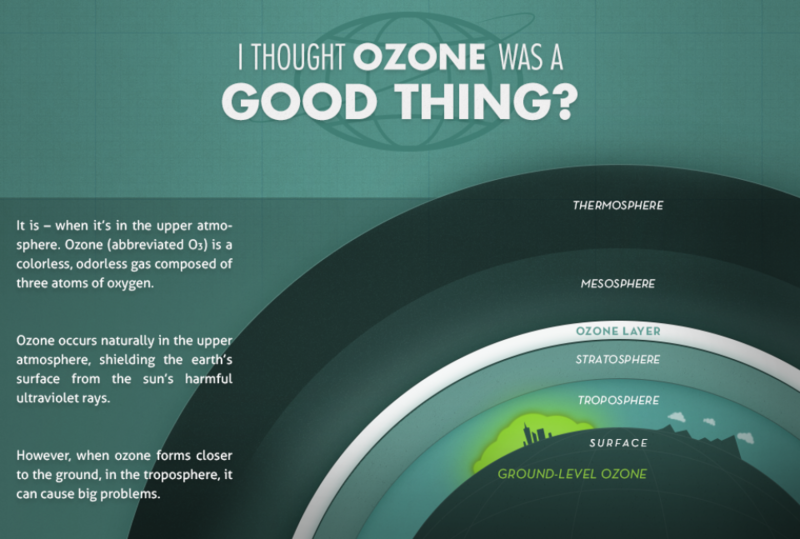 Ozone can be split into two major types: Stratospheric Ozone and Ground-Level Ozone. Stratospheric ozone, also known as the "ozone layer" forms high in the atmosphere, 6-30 miles above the earth's surface, when intense sunlight causes oxygen molecules (O2) to break up and re-form as ozone molecules (O3). These ozone molecules form the ozone layer and are commonly referred to as "good ozone." At concentrations as high as 12,000 ppb (the EPA considers anything over 70 ppb to be unhealthy for human health and welfare) this ozone protects and shields people, trees, crops, property, and microorganisms from the harmful effects of the sun's ultraviolet light. Ground-level ozone forms just above the earth’s surface (up to about 2 miles above ground) and impacts human, animal, and plant respiration. Although ground-level ozone is less concentrated than stratospheric ozone, its impacts on human health and welfare make ground-level ozone "bad ozone." Ground-level ozone can is an irritant and can negatively affect human health and welfare. Weather plays a substantial role in formation of ground level ozone. Ground-level ozone concentrations typically are highest on days warm/hot days with low humidity when wind is light or stagnant. Ozone concentrations in Central Texas get get high enough to be considered "Unhealthy for Sensitive Groups" as early as March and as late as October. These effects may lead to increased school absences, visits to the doctors and emergency rooms, and hospital admissions. Research also indicates that ground-level ozone exposure may increase the risk of premature death from heart or lung disease. Some people are more sensitive to ozone than others. Sensitive groups include children, older adults; and, people with lung disease such as: asthma, emphysema, and chronic bronchitis. 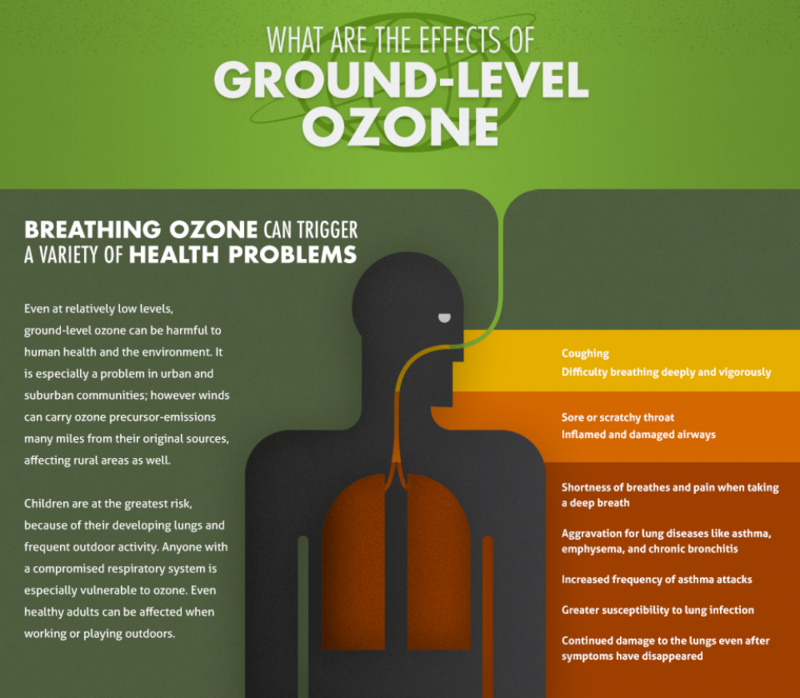 Even healthy adults who are active outdoors can experience ozone's harmful effects. How else does ground-level ozone affect the environment? For more information on ground-level ozone and agriculture, click here. When does Central Texas typically experience high ozone? Since 2010, Central Texas has had ground-level ozone levels that are considered by EPA to be "unhealthy for sensitive groups" as early as March and as late as October. The months when high ozone is most common are between May and June and between August and October. "Moderate" ozone levels have been recorded as early as February and as late as November. High ozone levels are less likely to occur on Sundays than any other day of the week due to lower mobile source emissions. On high ozone days, the highest ozone levels typically occur from about noon to 5 pm. What types of weather conditions contribute to high ozone?